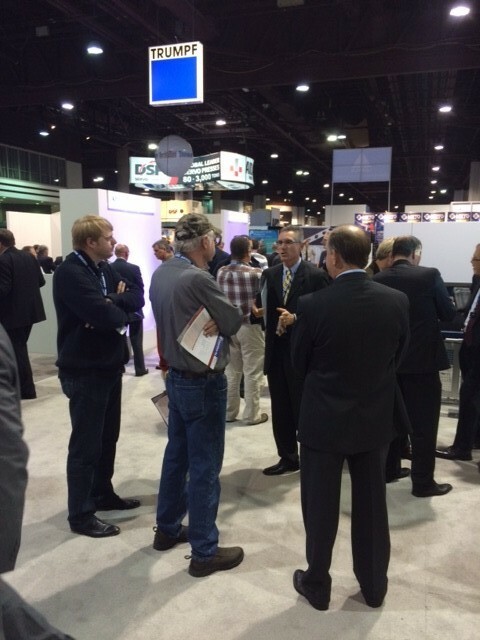 Join us where the industry comes together to learn about the latest advancements in the manufacturing industry! Whether you are an experienced laser tube processor or new to laser tube cutting, how can you get more out of your production in the future? Learn more about intelligent machine functions from TRUMPF at this event. During the second half of the seminar, you will find out how lasers can weld materials with an almost unparalleled versatility in a range of applications, from creating fine weld points of just a millimeter in diameter in an instant, to producing deep-welded seams stretching over several meters. 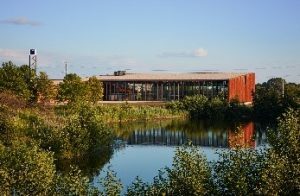 After the seminar there will be an option to hone your skills in clay shooting at the beautiful Milford Hills Hunt Club in Johnson Creek, Wisconsin. The seminar is designed to present TRUMPF’s portfolio of bending machines to aleviate your decision process in finding the right machine for your needs. Various bending techniques will be demonstrated including die bending, edge bending and panel bending. All TRUMPF press brakes series 3000, 5000, 7000 and 8000 will be featured by showing each machine’s capabilities and advantages depending on the complexity, precision, speed and tonage demands of the parts to be fabricated. In addition, bending machines with automation components that are able to handle a wide range of parts with consistent quality will be presented as well. Experts in bending will answer your questions on your specific needs. After the seminar, you will take home the knowledge of the latest technological advances in bending. Please make your reservation soon, as space is limited. Join us at the TRUMPF Booths A2601/B103/B11013 from November 6-9, 2017 at McCormick Place in Chicago, IL where TRUMPF will showcase its latest and greatest products in three separate booths in three themed areas: the Forming and Fabricating Pavilion, the Tube & Pipe Pavilion, and the 3D and Additive Manufacturing Pavilion. 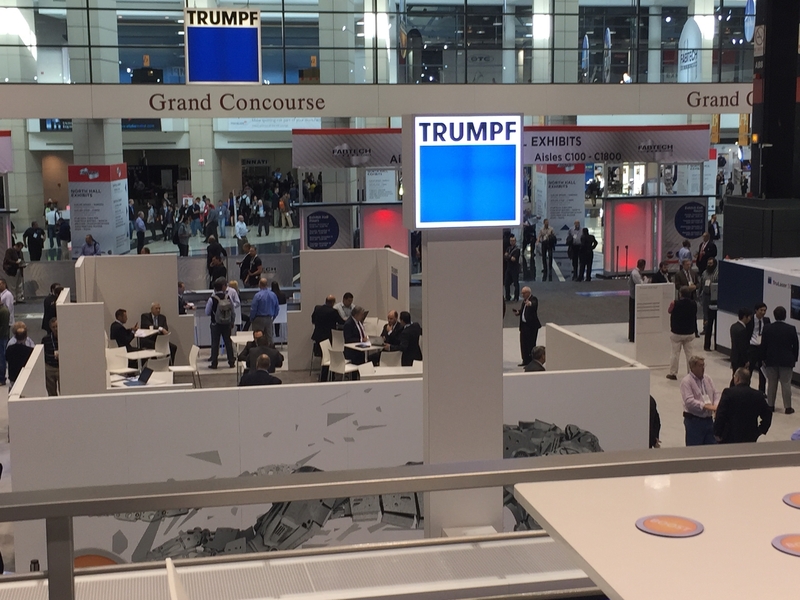 In the main booth, booth A2601, in the Forming and Fabricating Pavilion, TRUMPF will highlight its TruConnect approach to manufacturing through the customized production of a part. During the show, there will be a shuttle service to the new Smart Factory, TRUMPF’s new state-of-the-art showroom at Hoffman Estates, IL. 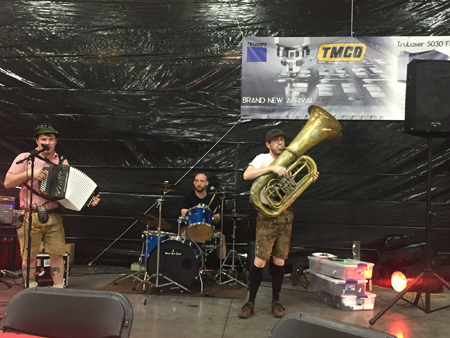 TMCO inc. held its 43rd open house on October 19 and 20 in form of an Oktoberfest. The event was held in their facility in Lincoln, NE that was built near railroad tracks. TMCO was founded in 1974 by Roland Temme who is still CEO of the company. 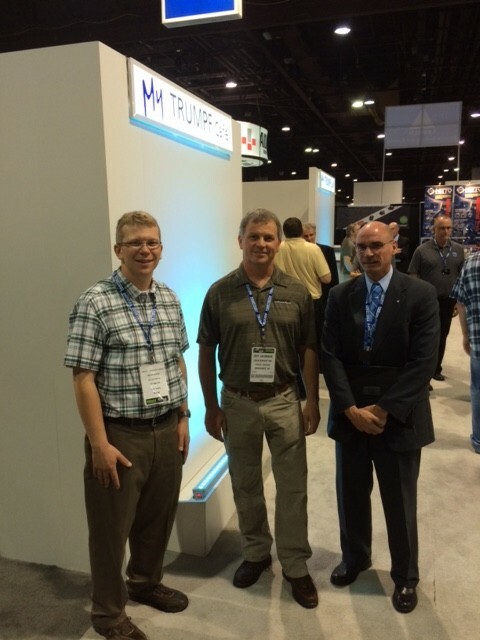 TMCO started out as a machining company and broke it’s first million dollar in sales in 1984. In 2002 a new facility was built with the addition of new lasers. In 2017, TMCO added an 8kw TRUMPF TruLaser 5030 Fiber with BrightLine Technology. The Stopa automation will be added in 2018. 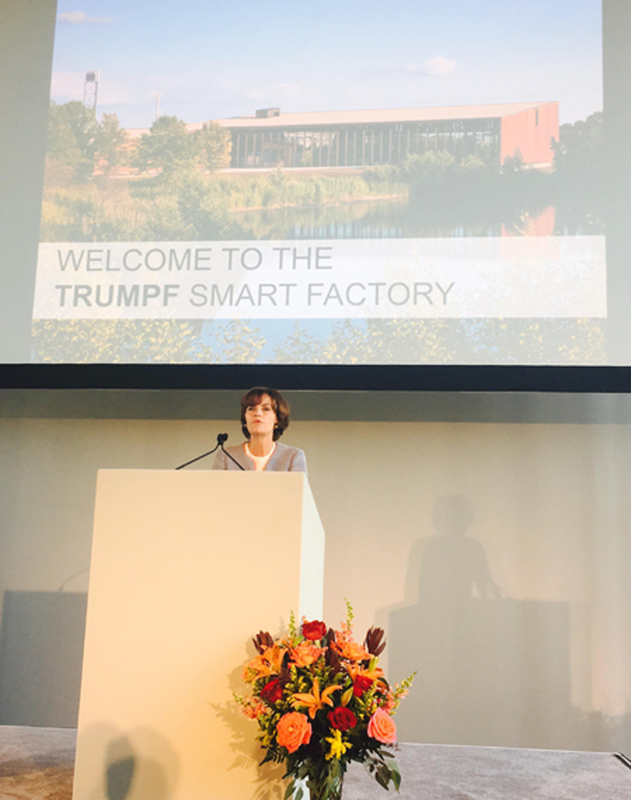 On September 12, 2017, TRUMPF held on opening ceremony for their new Smart Factory in Chicago. 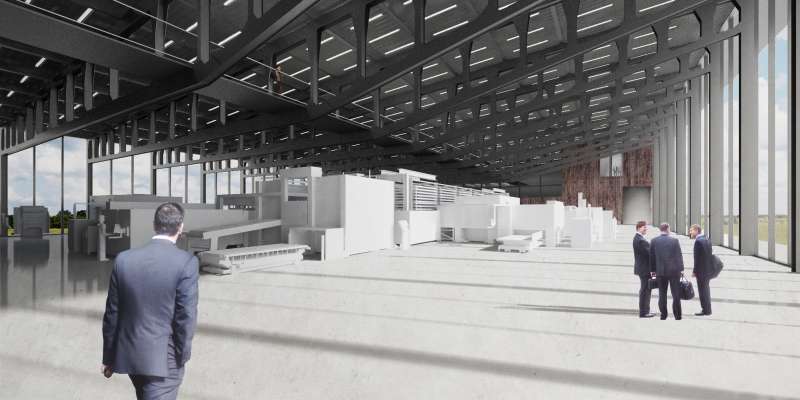 Inside the state-of-the-art building, a fully connected and automated factory according to Industry 4.0 standards is showcased. 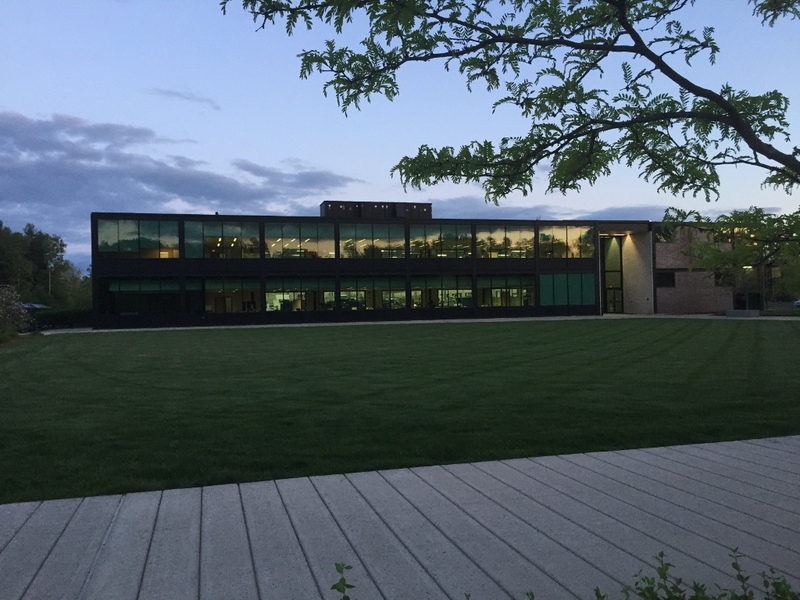 The event was held inside the beautiful facility, designed by architects Barkow Leibinger, in Hoffman Estates, IL. Chairmain and CEO of TRUMPF Inc., Dr. Nicola Leibinger-Kammueller, gave an opening speech in front of 250 invited guests. The MN Chapter of the German American Chamber of Commere (GACC) held a luncheon on September 27 hosted by Saint Paul College with guest speaker Dr. Christine Benz, Training & Development Manager at TRUMPF Inc. Dr. Benz gave an exciting and informative presentation on the tremendous benefits of the German Dual Education System. 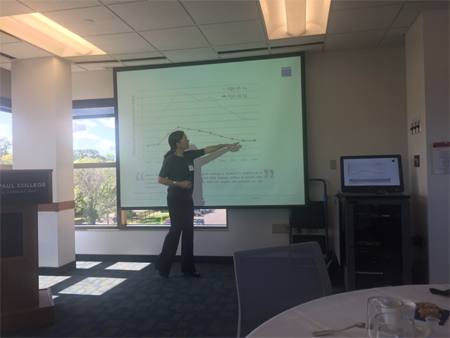 Her presentation included how she led the implementation of the system at the US headquarters of TRUMPF in Farmington, CT. It has since gained more and more popularity due to the apparent benefits of building a broad skill level within the apprentice pool, enhanced productivity and innovation, lower training and recruitment costs and employee engagement and loyalty. A system that is well worth considering for many coroporations in the US. Dr. Christine Benz was introduced by Christa Tiefenbacher-Hudson, Managing Director of SVP and Honorary Consul of the Federal Republic of Germany, ret. 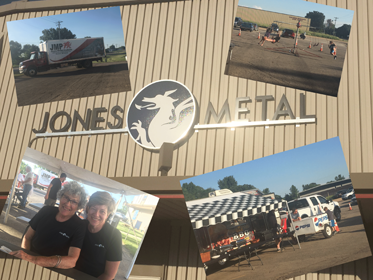 JONES METAL CELEBRATING THEIR 75th ANNIVERSARY! On June 8, 2017, Jones Metal celebrated their 75th anniversary on their campus in Mankato, MN. Families, friends and partners were invited to celebrated this milestone together with the Welsh rooted Richards family, who owns and operates Jones Metal in the third generation. 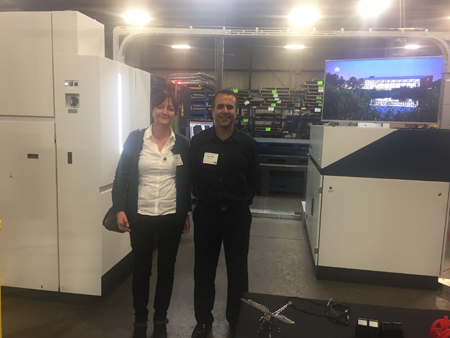 After welcoming the guests, Sarah Richards the CEO of Jones Metal, led numerous company tours and was proud to showcase various TRUMPF machines as part of their state-of-the-art fabrication processes. 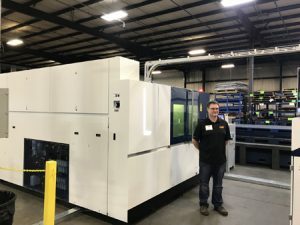 Jones Metal recently purchased a third generation TruBend 5320 to complement their highly automated laser systems. Services provided by Jones Metal are focused on advanced metal fabrication for original equipment manufacturers in various industries. 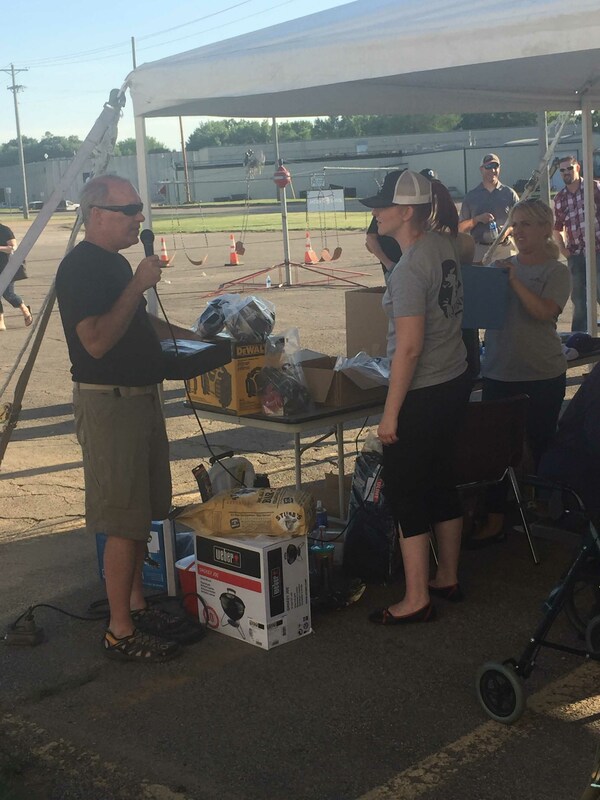 The day was fun-filled with a splendid Barbeque, great conversations and various activities including a prize raffle with Vice President, David Richards, as the auctioneer. Maintecx would like to congratulate the Jones family to their 75th anniversary and continued success. We are proud to count them among our group of loyal customers. 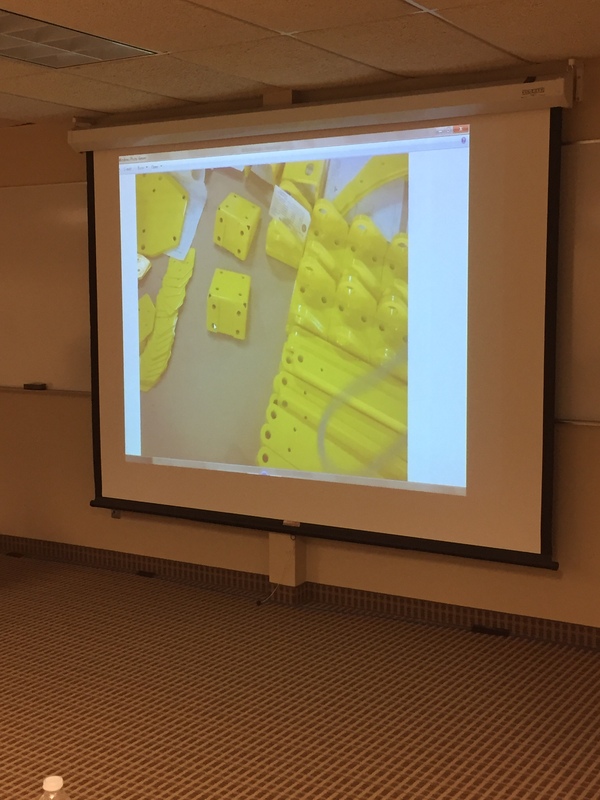 SHEET METAL DESIGN SEMINAR – THANKS FOR COMING! Thank you to all of our customers that took part in the Sheet Metal Design Seminar. The seminar was received as a great opportunity to learn about the new techniques in laser cutting, bending, punching and laser welding. Especially helpful according to the feedback we received were the group exercises that helped to understand the bending and punching tools and their capabilities. The students also enjoyed drawing the best design for a fire grill that would make it the most efficient in mass producing it. The different array of parts that were shown and discussed was another highlight of the class. The customers gained new ideas in part design and intend to present them to their company. We are happy to have perceived such positive feedback and will offer the class again in the future. 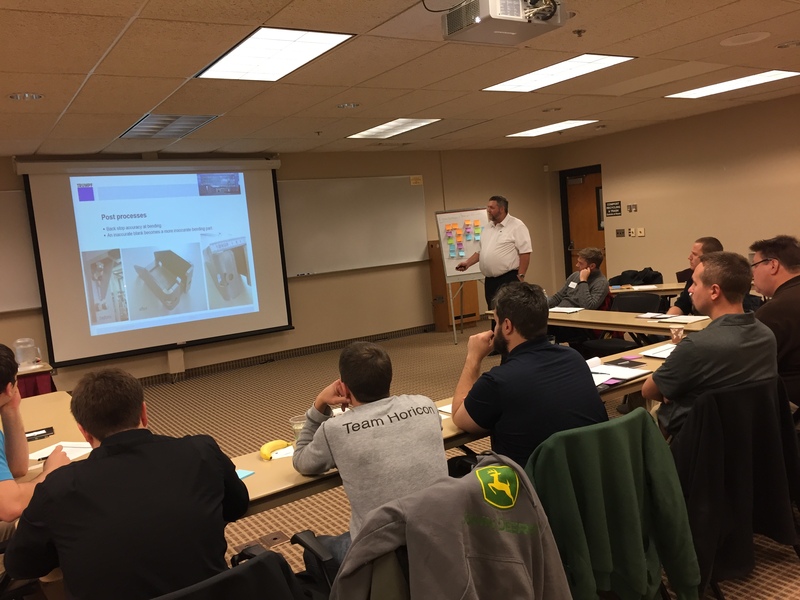 The Sheet Metal Design Seminar provides an overview knowledge on how to make full use of state of the art sheet metal technology to streamline the design process, design better parts to replace or make improvements on current manufacturing processes with the overall goal to reduce manufacturing cost. The one day seminar targets owners/managers of fabricating shops, engineers, designers and programmers. Some design and/or CAD/CAM knowledge is required. 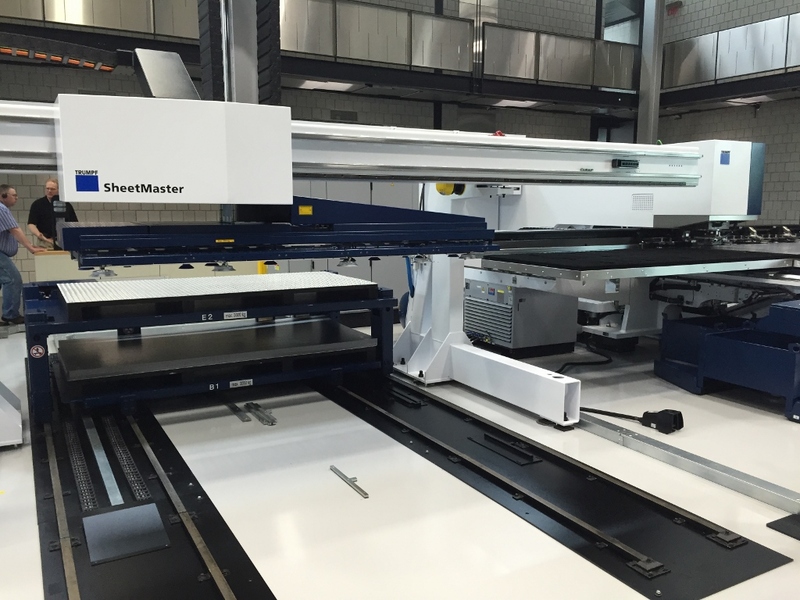 Learn from the expert in sheet metal design Grant Hagedorn of TRUMPF Inc. 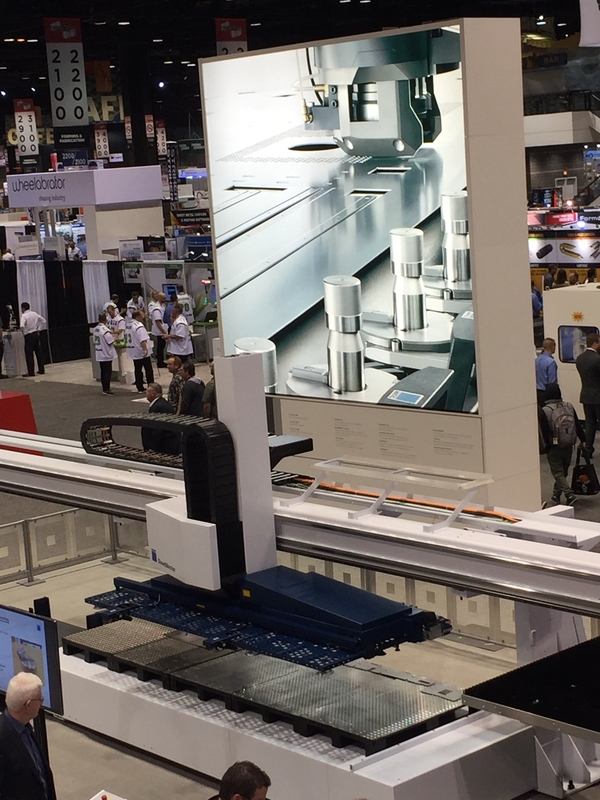 In booth C35041 at FABTECH 2016 in Las Vegas, TRUMPF will demonstrate an array of innovative fabricating machinery, automation solutions and supporting technologies designed to help to improve your manufacturing processes and overall business. The show takes place November 16-18, 2016 at the Convention Center in Las Vegas, NV. In addition, representatives from our TruServices team will be on hand to discuss how TRUMPF supports the entire life cycle of your equipment with the best training, service agreements, financing, consumables, tooling, and other solutions. 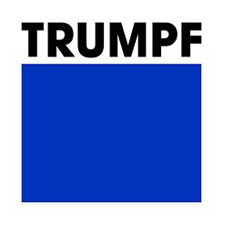 The event and all trip/lodging related costs are a compliment of TRUMPF Inc. The Tech Seminar held by maintecx and TRUMPF from April 19th to 21st proved to be quite successful! 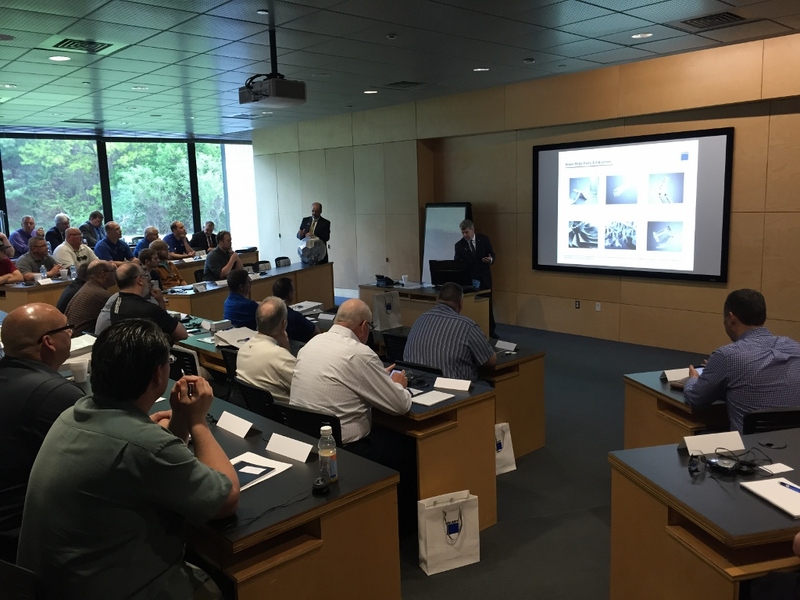 Maintecx brought over 40 customers from the Midwest to TRUMPF’s headquarter in Farmington, CT to look at “what’s new in Blue”. 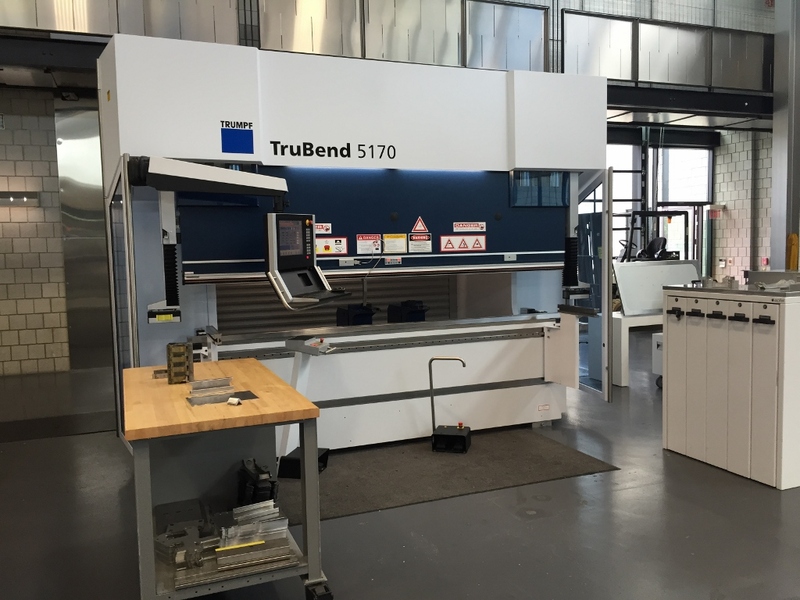 At the newly designed TruBend Demo Center of TRUMPF, the customers were able to witness demo runs of the TruBend Cell Series 5000 and 7000. The all new designed and first time demonstrated TruBend 5000 series is now equipped with a new On-Demand Servo Drive with 4-cylinder drive technology – among other features – leading to significantly more productivity. TRUMPF’s new panel bender demonstrated the bending of parts with geometries not possible with a traditional panel bender. 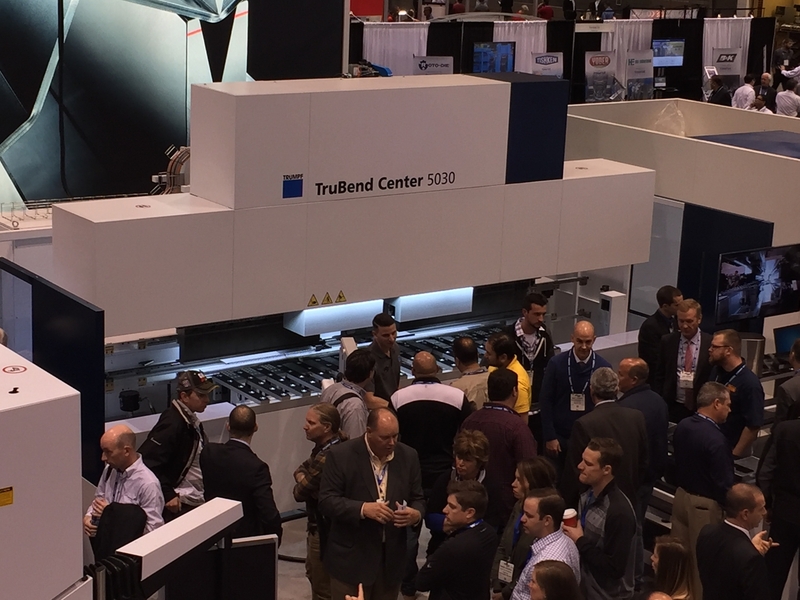 The brand new TruBend Center Series 5000 – integrated with automation – was originally introduced and well received in November 2015 at the Fabtech show in Chicago. 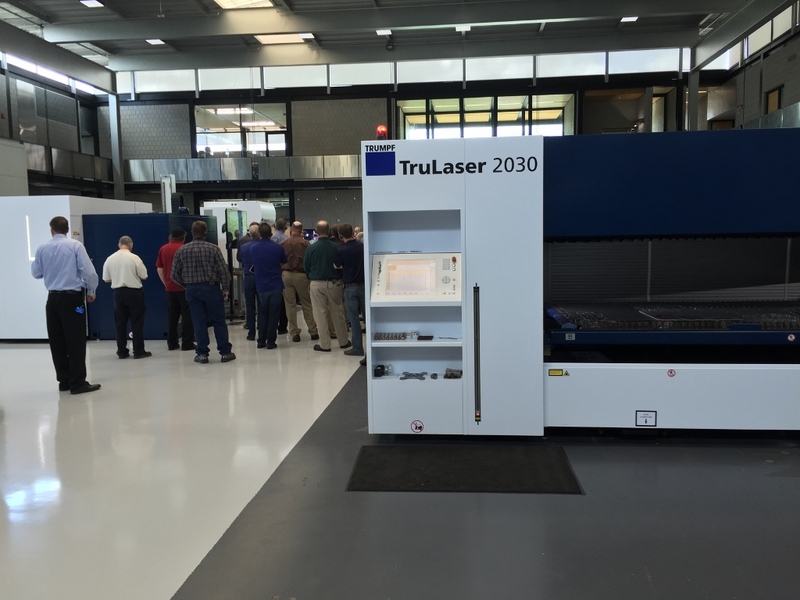 Further highlights included the demos of TRUMPF’s TruTube Laser cutting machines of the series 5000 and 7000. 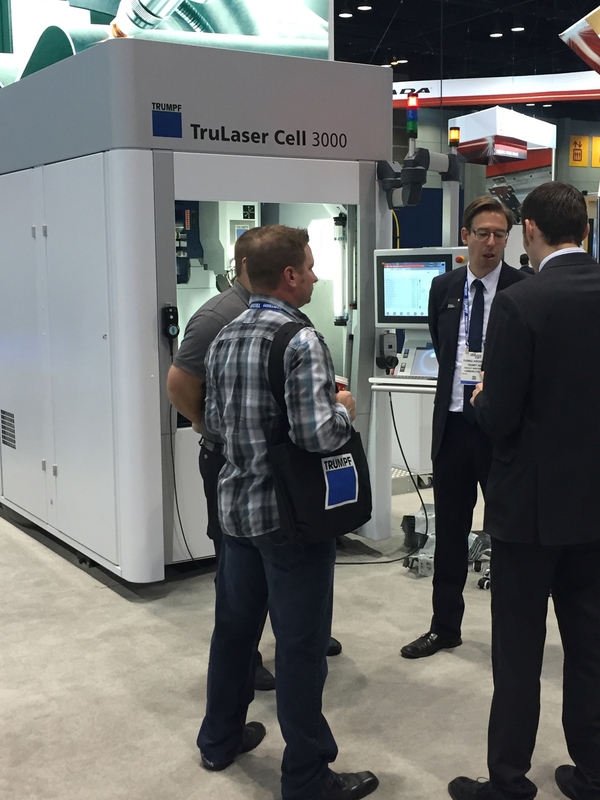 Quite some interest was gathered from TRUMPF’s compact TruLaser 2030 machine, powered by a 3kw or 4kw fiber laser. 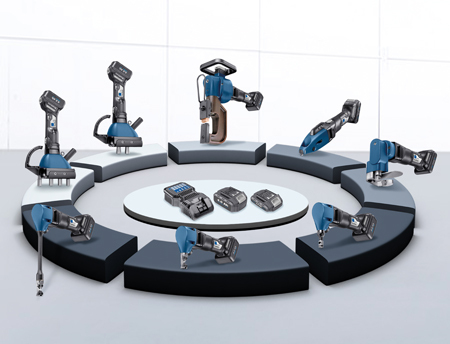 A variety of optional automation components can help to increase productivity. This product – with a very small footprint – was designed and produced only in the US. During the lectures, customers learned more about Industry 4.0 also known as “The Internet of Things” with the “Smart Factory” supported by TruConnect. It is widely realized that a company’s production chain does not end within its building, but rather extends to various other institutions like suppliers and customers via communication through “the cloud”. TRUMPF’s commitment to industry 4.0 is reflected in the founding of AXOOM, a TRUMPF subsidiary that has the integration of all business platforms in one digital system as their core goal. TRUMPF’s new machine software, TruTops Boost, is also an integral part of TruConnect in their efforts to streamline communication via different platforms. It was a pleasure to show our customers all the new equipment and please contact us with any remaining questions. Join us for the TRUMPF Technology Seminar, co-sponsored by TRUMPF and Maintecx Machine Tool, and learn about the latest in sheet metal fabrication technology at TRUMPF North American Headquarters, Farmington CT. Participate in informative presentations on laser cutting, bending, punching and automation. Also, learn about the benefits of the new TruTops Boost Software, Laser welding and the new Panel Bender. Tour the TRUMPF North American headquarters campus and see our latest additions and improvements to our manufacturing operations. Flights, accommodations, ground transportation and meals provided courtesy of Maintecx Machine Tool and TRUMPF. America’s largest show for technology, equipment and knowlegde was another big success with 1,700 exhibitors and over 43,000 visitors marveling at the latest developments in the industry. 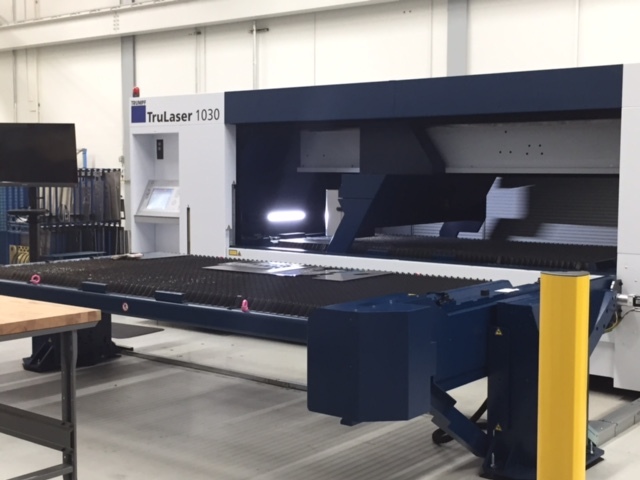 The TruLaser 2030 features a fully integrated 4kW TruDisk laser for supreme cut quality in a 60 inch x 120 inch working range. The new flexible option for loading and unloading gives customers the choice to run production with the standard pallet changer or the fully automated LiftMaster Shuttle for complete lights-out production. 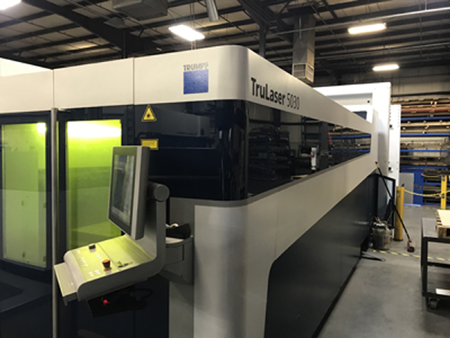 With the revolutionary BrightLine fiber technology and an 8kW TruDisk laser, the TruLaser 5030 fiber is the most productive and universal laser cutting solution in the industry. 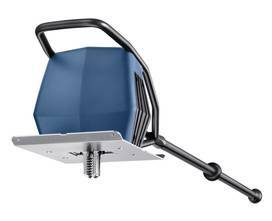 It is capable of processing up to 1 inch mild steel, stainless steel, and aluminum with impressive speed and quality. The new Smart Collision Prevention and the Drop&Cut options provide increased efficiency and reliability. With Drop&Cut, operators see a live image of the machine’s interior and can easily drag a new programmed contour to any desired location to easily utilize material remnants. 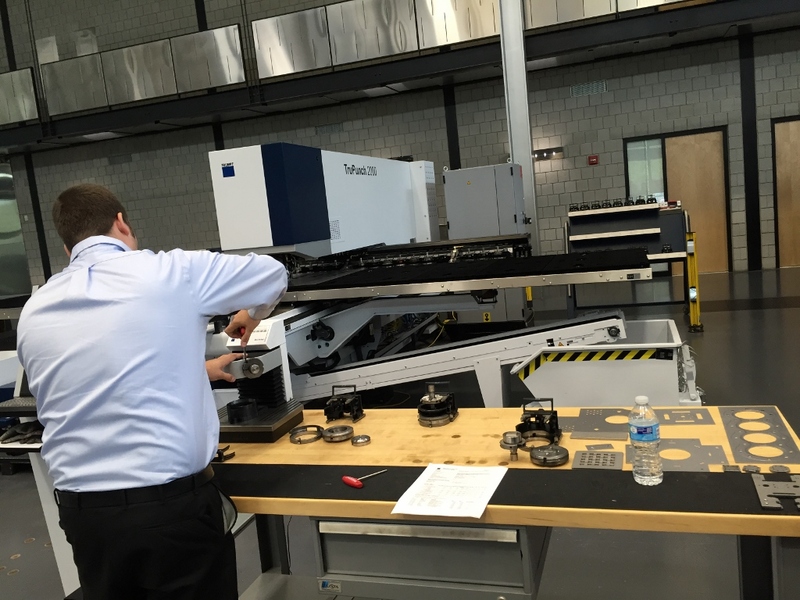 TRUMPF’s first panel bending machine is a perfect complement to the TruBend product line. With a bending length of 10 feet, this machine can produce positive and negative bends, as well as folds and circular bends with a variety of radii which significantly reduce set up times and tooling costs. 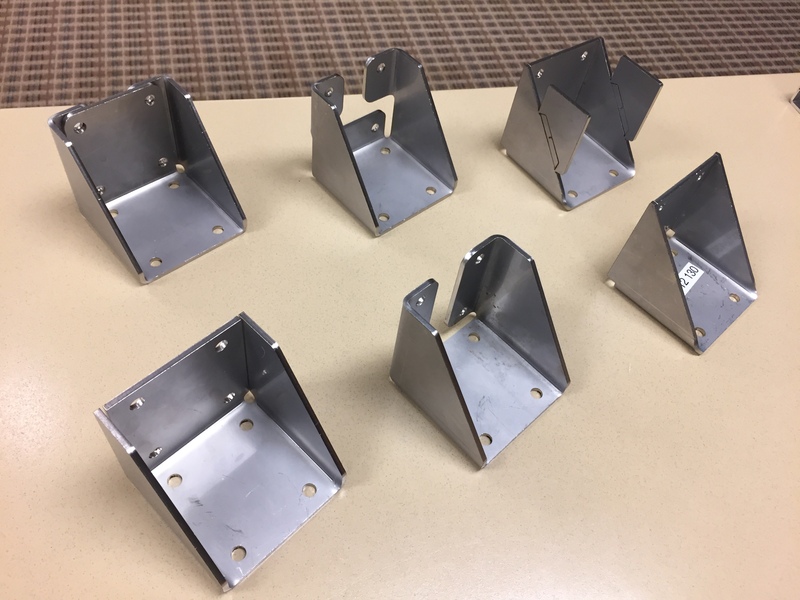 Fabricators are able to process an extremely wide variety of parts that reach far beyond the traditional range of panel bending and can form complex components with great productivity and precision. 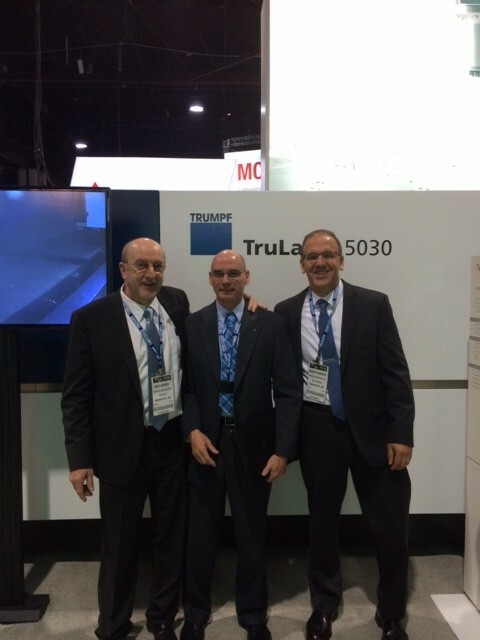 The TruPunch 5000 with Sheetmaster was shown for the first time in North America with new features including retractable clamps, mobile control, and the new ToolMaster Linear for additional tooling capacity. 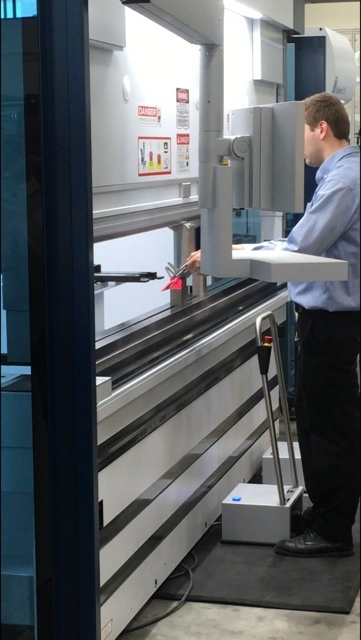 The machine also features smart punch monitoring, a unique technology that enables the machine to automatically detect a broken punch. It is available with a working range of up to 60 x 120 inches and can process material up to 0.312 inch thick. With its innovative On-Demand Drive, it is capable of punching at a rate of up to 27 strokes/sec. 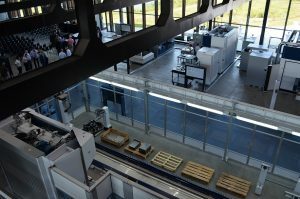 TRUMPF adapted a new philosophy in its new, unique software design and programming of laser, punching and bending machines. Due to its process orientation, TruTops Boost is easy to navigate. TruTops Boost allows you to work in two ways: with full automation using the HomeZone level or interactively using the TecZone level. You alone determine whether to use the Boost button in the HomeZone to let the software run automatically or whether to bring the full extent of your expertise to bear in the TecZone. Two operating levels provide a better overview as well as easy and fast processing of orders. Designing and programming become highly efficient when combined with these intuitive operating elements and parallel working modes. 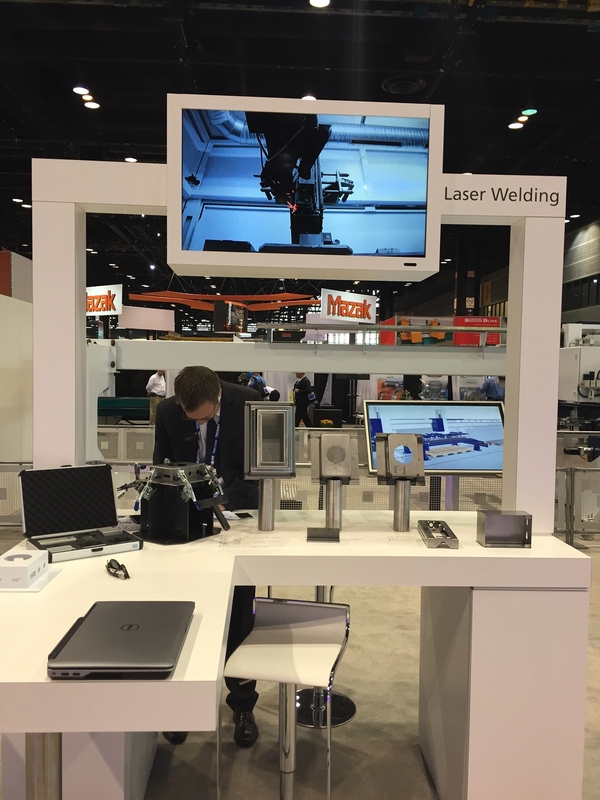 2301 S. Martin Luther King Dr.
and join us at the booth #S1701 to see the latest products in laser cutting , punching, bending, software and much more! 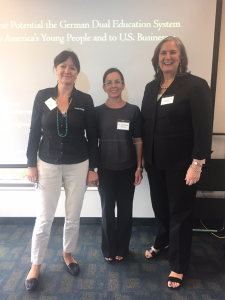 Women in Manufacturing Summit Big Success! From September 23rd to 25th 2015, women from all over the country employed in the manufacturing sector gathered for the annual WIM summit in Minneapolis. 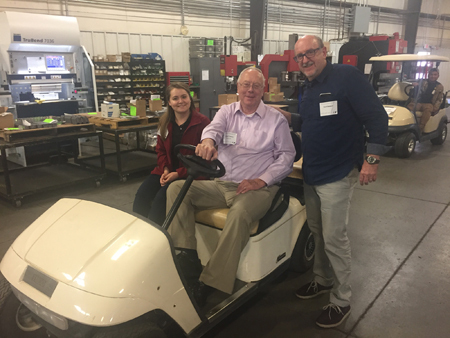 The event was packed with information on the current state of the manufacturing industry, thought-provoking lectures, round-table discussions and a silent auction. Women also enjoyed the networking opportunity with other women in their field. Sheila LaMothe, TRUMPF’s Manager for Marketing & Public Relations North America, serves on the WIM’s board of directors. She was instrumental in the success of this event by putting in countless hours working on the host committee preparing the event. Laser Welding of Sheet Metal Seminar Adding laser welding into your production capabilities can increase quality, efficiency, and profits when implemented appropriately. If you have been thinking about laser welding, but aren’t quite sure where to start, join us for this informative seminar. As a global leader in laser welding, TRUMPF has extensive expertise in laser welding applications. Learn from our experts to understand the benefits of laser welding and the considerations for successful implementation. RSVP no later than August 26th. Space is limited. Join us for the 5th annual Women in Manufacturing summit! 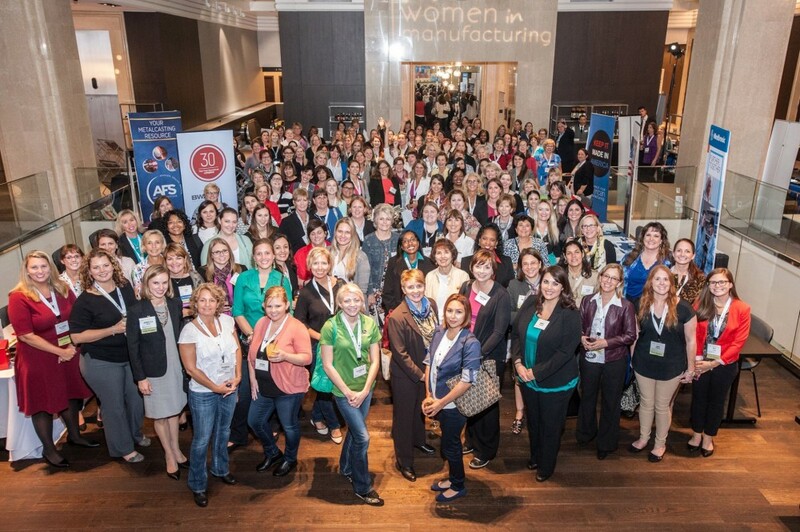 Held in Minneapolis, MN September 23 – September 25, 2015, this annual event is tailored for women who have chosen careers in manufacturing and want to share perspectives and network with others in their industry. The SUMMIT format includes keynotes speakers, panel discussions, professional development tracks, networking opportunities and plant tours. For additional event details and to register, visit www.womeninmanufacturing.org/summit2015. 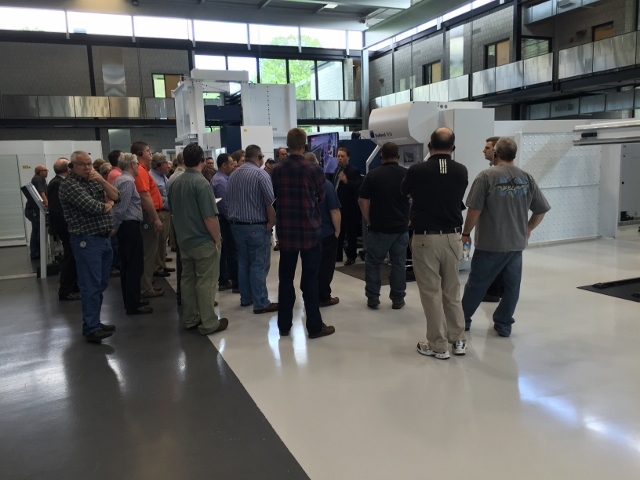 From May 11 to the 15th the first tech day week was held at the TRUMPF facility in Farmington CT . 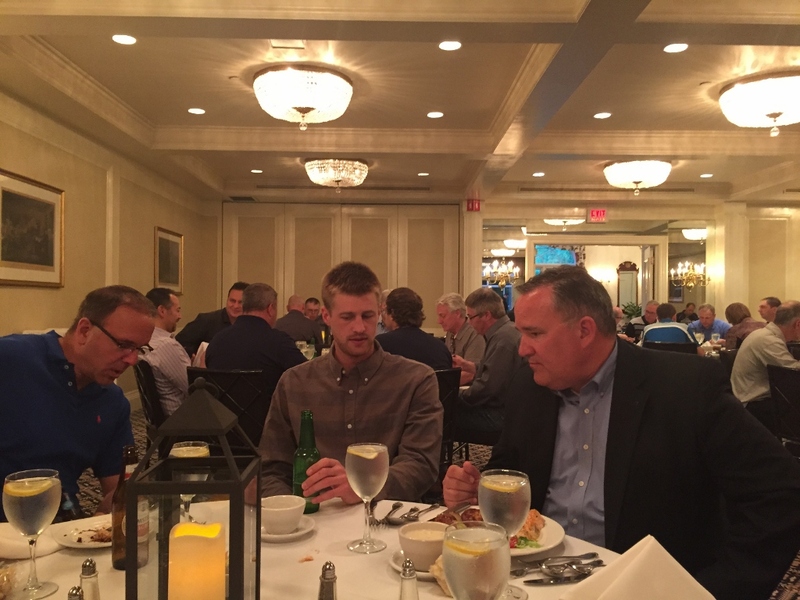 The maintecx team arrived with 30 customers from the Midwest on Tuesday night, May 12 and gathered for dinner at the quaint Avon Old Farms hotel in Avon, Ct. 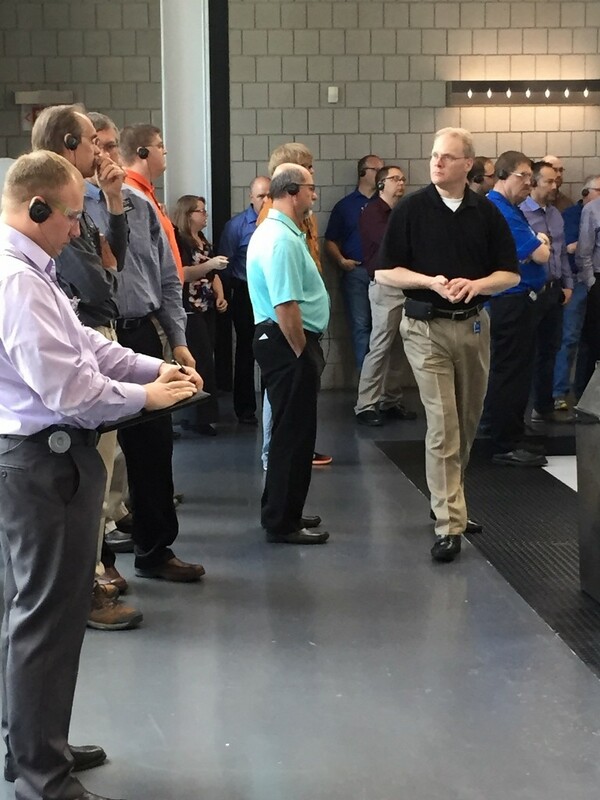 The group was shuttled to the TRUMPF Customer and Technology Center on Wednesday morning where Senior Vice President Burke Doar gave a warm welcome and an overview of TRUMPF’s history, ownership and sales numbers. The next in line was Brett Thompson with his very informative teachings on the different laser sources available on TRUMPF laser cutting machines. 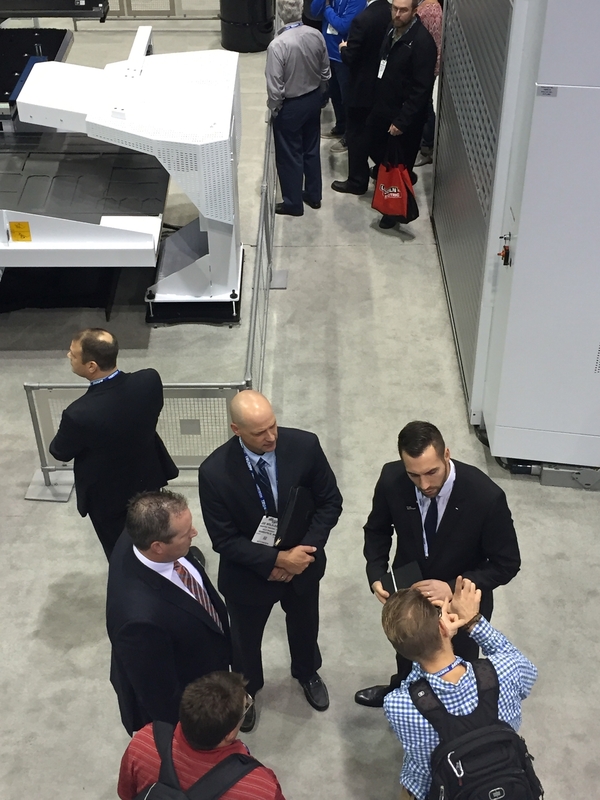 A demonstration of the new 3000 series press brakes performed by Tom Bailey was following. 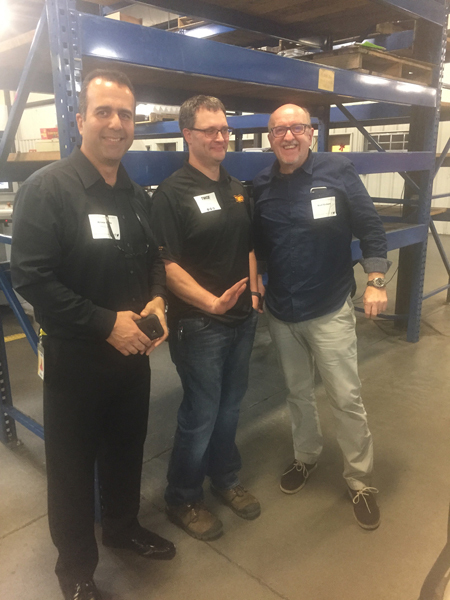 Brian Wels gave a presentation on punching products with focus on the new top-of-the-line TruPunch 5000, the fastest punching machine with the highest productivity world wide. A Rimowa aluminum case that included TRUMPF’s newest powertool, the drill DD1010, was raffled off in between the demos and won by Lawrence Will of Global Finishing Solutions. 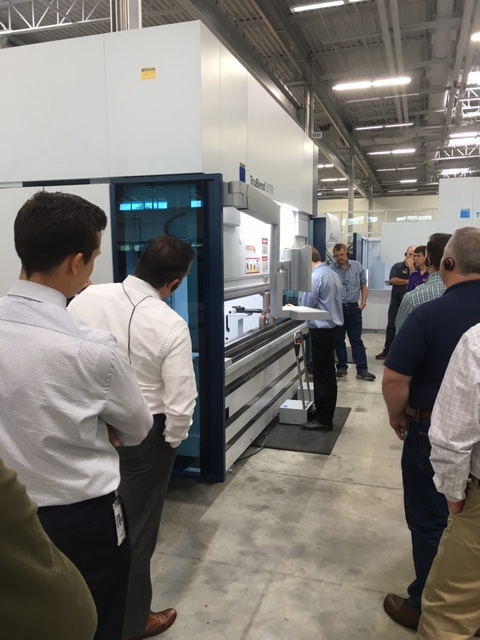 Shortly after, the customers learned more about the Trumatic 7000, TRUMPF’s high end combination machine, TRUMPF’s superior automation concept was demonstrated by Tobias Reuther and evaluated by Mr. Miller’s crew, enacted by Ted Fisher and Clint Miller. 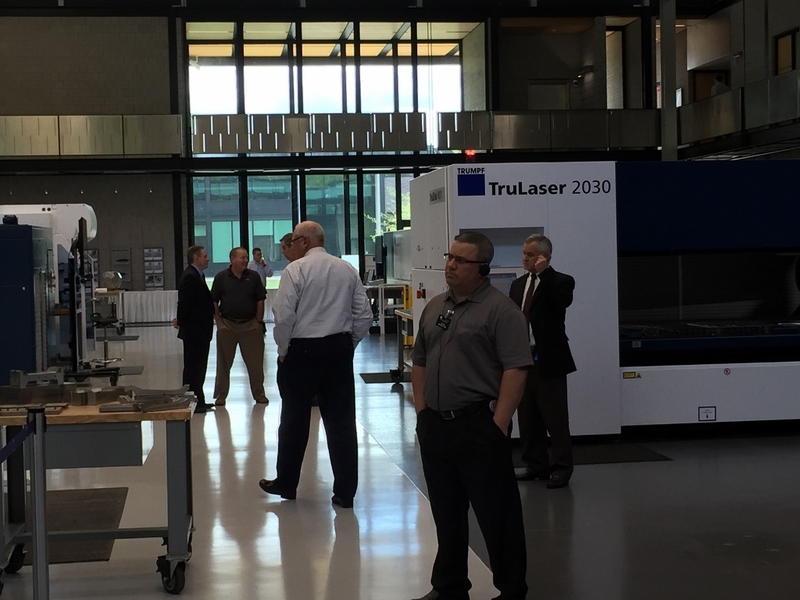 The brief lunch was followed by a facility tour showing TRUMPF’s manufacturing sites as well as training and service departments. 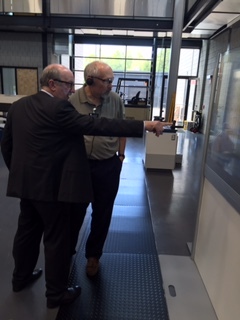 After returning from the tour, Alex Kunz presented the various TRUMPF services including power tools, tooling and consumables, TruTops software including the mobile service package and TRUMPF financing. He emphasized his belief in using TRUMPF original parts in order to ensure high performance and lifetime of the TRUMPF products. The customer were given the choice to participate in 2 of the break-out sessions covering the topics laser welding, Synchro, TruTops and TRUMPF financing. The day continued with demonstrations on all TRUMPF products including automation. Every customer could find the product of his interest and ask specific questions. The tech day, packed with plenty of information ended with a reception and dinner at the TRUMPF Customer and Technology Center. 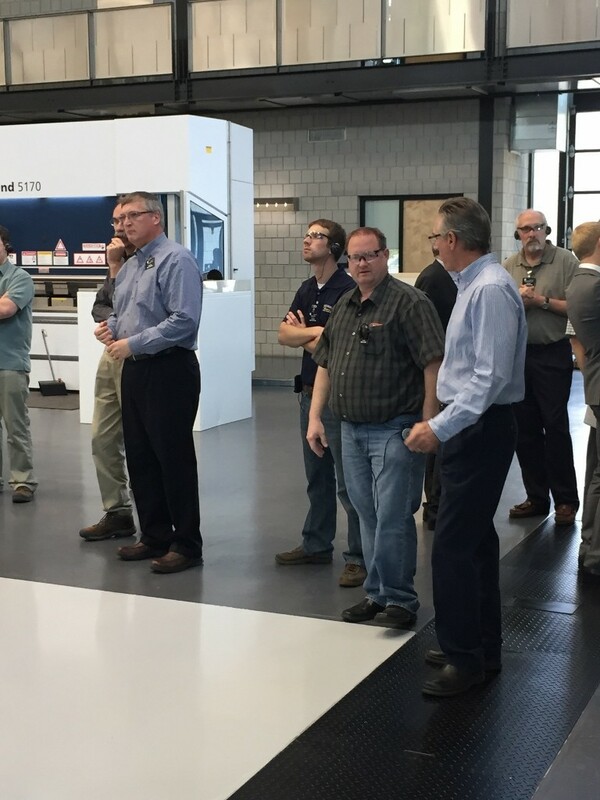 Thank you to everyone for taking the time to participate in TRUMPF’s Tech Day in May! Join us for Tech Day in May, co-sponsored by TRUMPF and Maintecx Machine Tool, and learn about the latest in sheet metal fabrication technology at TRUMPF North American Headquarters, Farmington CT. Participate in informative presentations on laser cutting, bending, punching and automation. Meet TRUMPF’s Technical Service Team and see how we are responding to our customers’ requirements. Learn how TRUMPF machines are made using SYNCHRO lean manufacturing techniques and visit the largest laser factory in North America. Benefit from breakout sessions focused on TruTops software, TRUMPF financing options, SYNCHRO principles and how to add laser welding to your capabilities. Learn about TRUMPF’s extensive service offerings in the TruServices Marketplace and see live demonstrations of the latest TRUMPF technology in our newly equipped Customer Technology Center. To reserve your place for this unique event, click here or call Inge Biekert at . Please RSVP as soon as possible since space is limited. 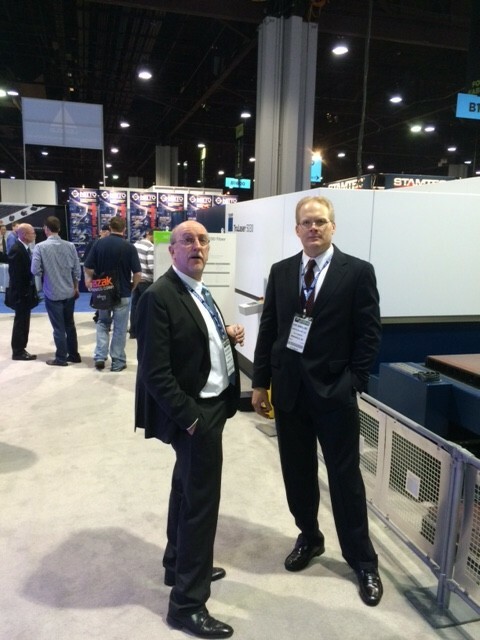 Fabtech 2014 took place at the Georgia World Congress Center in Atlanta from Nov. 11th-13th. 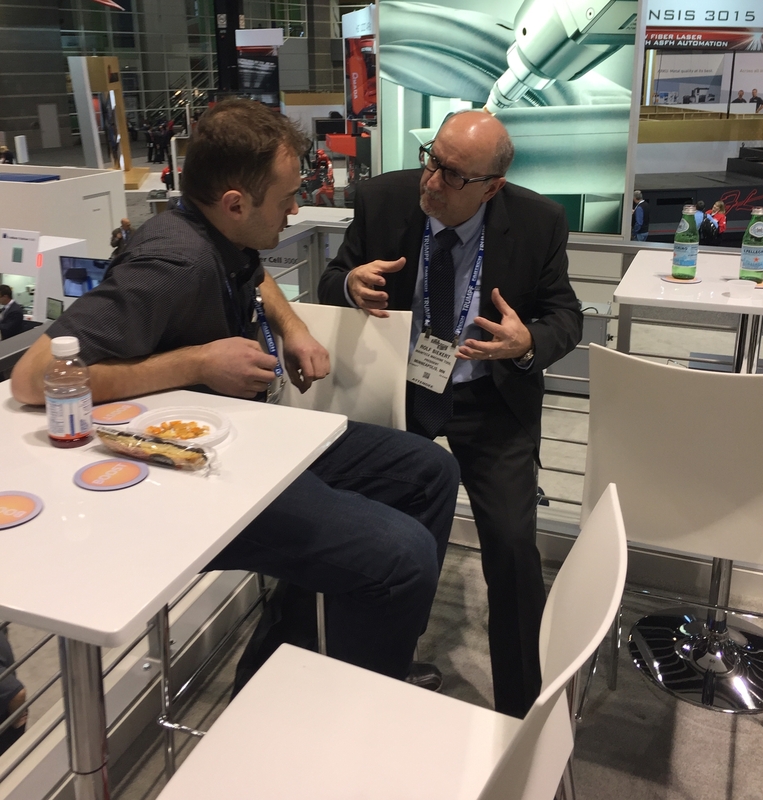 The very well attended Fabtech show with more than 1400 exhibitors presented lots of new and innovative products to over 27.000 visitors. The most impressive, top of the line TruLaser 5030 fiber with brightline and a 8Kw solid state laser allows cutting speeds and productivity gains never witnessed before. Secondly, a newly released TruLaser 3030 with a 4Kw solid state laser, to fill in the gap between the existing 3Kw and 5Kw machines. Last but not least, a newly developed TruLaser 2030 with a 4Kw solid state laser as the most economic solution to cut thinner gauge and reflective materials. TRUMPF punching products also impressed with a new family member. 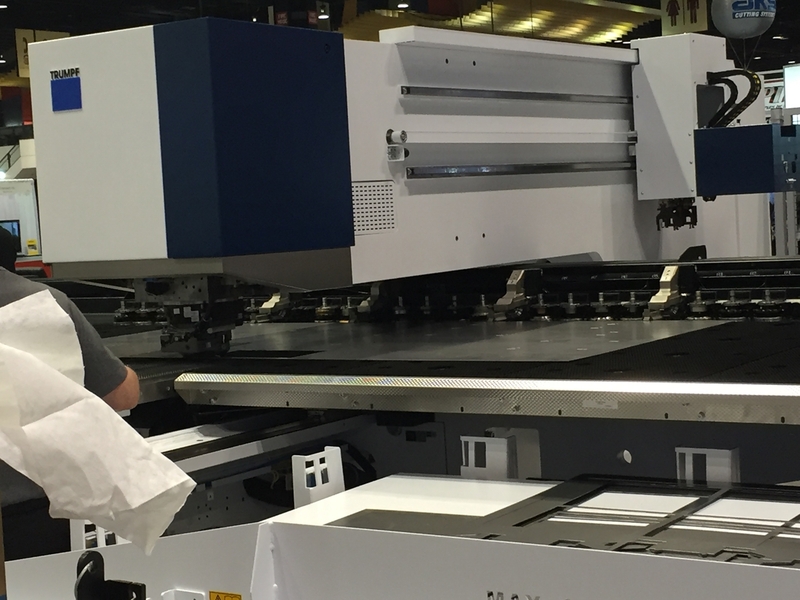 The recently developed TruPunch 2000 with the SheetMaster Compact features a 50 inch x 100 inch working range and processes material up to 0.250 inch with lights-out capability. 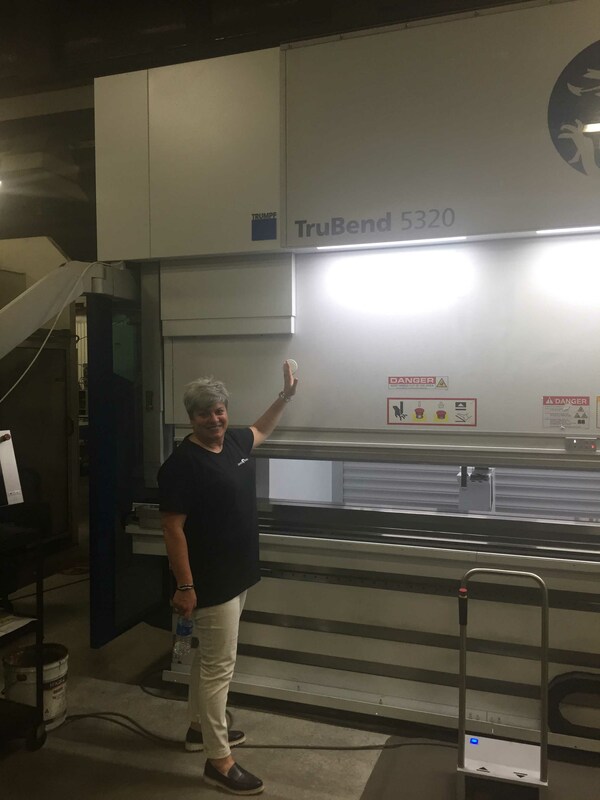 A new TruBend 3100, as a very economical solution to enter the high precision bending world was introduced to the North American market as the first product of the new 3000 series product line. To demonstrate state of the art fabricating including laser welding, sample parts were cut on the Trulaser 2030, bend on theTruBend 3100 and laser welded on the TruLaser Robot 5020 before finally laser marked either on the TruMark 5020 or the latest introduced TruMark 5010 Mobil Marker. Utilizing high precision equipment and high quality processing allows generating products without secondary operations. Maintecx, your local sales and service representative in the upper Midwest would like to thank all the customers coming to the show and their interest in working with us on future projects.